MISINFORMATION INCOMPLETE REPRESENTATION AND LAZY RESEARCH DRIVES ME CRAZY! Yet one more TV news report about organics foods not being any more nutritious than the non-organic products. NEW FLASH! Organic is about not having toxic chemicals used on the food you eat. If by chance they turn out to be more nutritious that is a bonus. It means not only will the food you eat not kill you, it might be healthy for you as well. If a carrot is a carrot then I would like mine without a side of toxic chemicals please. SO IF YOU ARE GOING TO REPORT ON THE PROS AND CONS OF SOMETHING, DO YOUR RESEARCH AND DO NOT COMPARE APPLES TO ORANGES, ORGANIC OR NOT! Another example is the regular reporting of links between sugar and hyperactivity and, that ADHD can be treated by eliminating sugar. One study from the 1970's is quoted over and over again as proof, even though this theory has been tested and retested and studies failed to prove that sugar causes hyperactivity. Further more the symptoms we associate with ADHD, are similar to those of many other health issues. There is so much good research and studies about ADHD, and so many health issues, why not use those! REPORT ON HOW STATISTICS AND STUDIES OUT OF CONTEXT AND STUDIES WITH POOR METHODOLOGY MISREPRESENT INFORMATION AND IMPACT PUBLIC OPINION. REPORT ON WHY THIS MAKES RESPONSIBILITY IN REPORTING SO IMPORTANT! Another thing that makes me want to scream is the myth that the women's movement is over and we are equal now. The belief that maybe there are still issues in other countries, but not in Canada. Feminism is not a bad word and it is a myth that we have achieved equality. There are many women who went before us and sacrificed and paved the way for whatever progress we have made. Without their efforts we would not be "persons" or have the vote, to name a few. If it was true and we no longer need to carry on the fight, then women in politics would not be judged differently then men, and their appearance would never be more important than their policies. LISTEN UP LADIES; IT IS OUR JOB TO REMEMBER AND RESPECT THOSE BEFORE US, AND CONTINUE TO PUSH FOR CHANGE SO THAT THOSE WHO FOLLOW WILL HAVE FAIR TREATMENT AND EQUALITY. And finally, when credit is not given. Today I watched a show talking about the newly established National Cord Blood Donation Bank. I know this a wonderful thing, I really do, but the new part is the National part. Starting in 1996 a Alberta public donation bank was established. I know because I was this first person from the hospital I delivered my son at to donate my cord blood which had to be shipped to Alberta. In 1997 Ontario opened a public donation bank. So from 1996 until the present women have been donating cord blood. I am not referring to banking for ones private use, I a referring to donating to a public bank. Many of us did not hear about this through doctors, we heard of this by word of mouth from woman to woman. In fact the doctor who delivered my son was actually arguing with me 3 minutes post delivery why I was bothering to donate the cord blood. (Jerk!) It would be nice if the women who have put in the effort to arranged to donate, and share the information with others and care providers since 1996 had been acknowledged. These women did this despite the fact that it involved considerable work, before the ease of the Internet, while pregnant and just after delivering a baby. IT ONLY TAKES A MOMENT TO GIVE CREDIT, AND SUCH A LITTLE THING WARMS PEOPLE TO THE CORE AND ENCOURAGES FURTHER SOCIAL INVOLVEMENT AND VOLUNTEERISM. Okay, there I am done my rant (for now). Yep, just Cathy thinking out loud about things that drive me crazy. 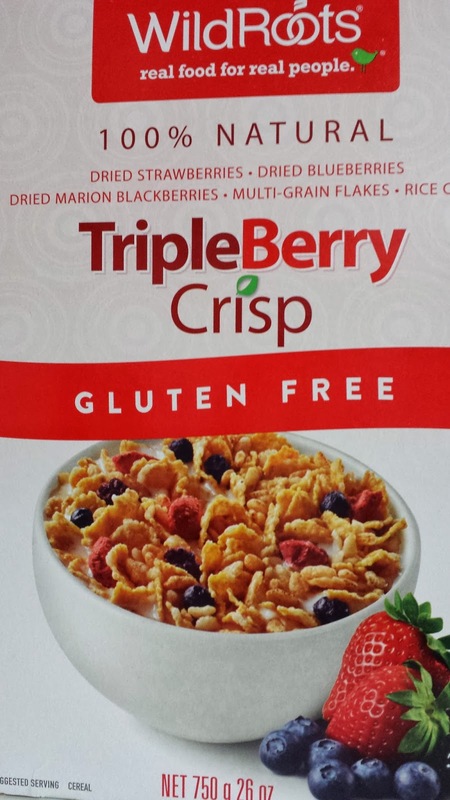 WildRoots TripleBerry Crisp Gluten Free Cereal Makes Me Happy! This is my very low-tech, non-scientific review of WildRoots TripleBerry Crisp Cereal. 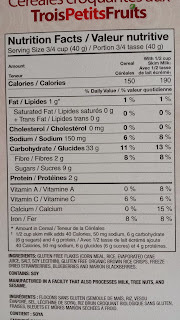 I will leave the label reading and the nutrition evaluation to the experts. 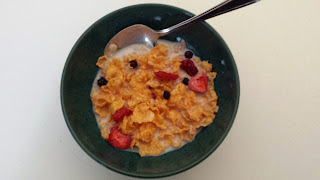 My roll will be to give you my honest opinion of a cereal I tried for the first time last week. While walking the rows of merchandise in Costco I came across WildRoots TripleBerry Crisp cereal. What caught my eye was the "gluten free" part and the fact that the picture on the box looked good. So I bought a box that included 2 bags totally 750 g for just under $9.00. I found this cereal to be very tasty and the flakes stayed crisp in milk and did not get soggy after 5 seconds. I hate when the flakes get soggy before you have a chance to eat your cereal. I did not feel like I was settling and giving up taste for the gluten free option. There were lots of berries in the cereal and it looked for once like the picture on the box. I would definitely buy these again, in fact I will need to do that soon since I ate both bags and we are now completely out. So "two thumbs up" from me for WildRoots TripleBerry Crisp. 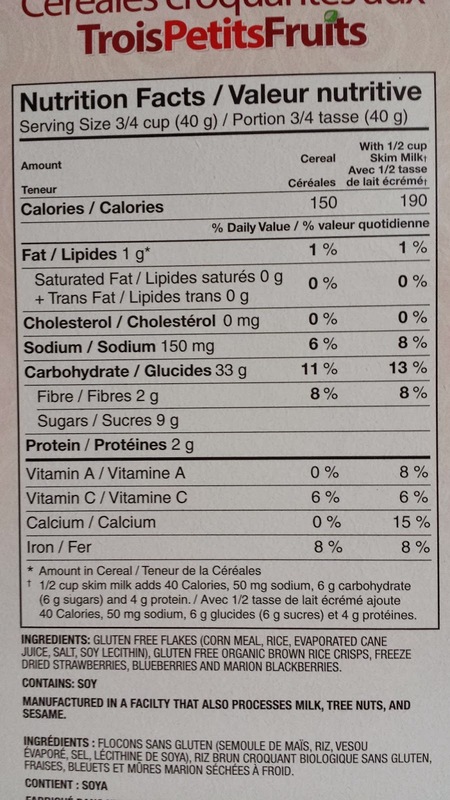 For those who need more details I have included the a shot of the Nutrition Label. 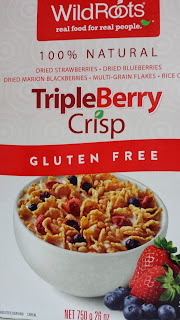 So there you go, I'm Cathy thinking out loud about WildRoots TripleBerry Crisp cereal. Note: I have not been compensated in anyway for this review. It is completely my own opinion. Annual Summer Road Trippin' Time! My Husband and kids had never been, and the last time I was in DC was on the Grade 13 High School History Trip (aka a LONG time ago). It was a great vacation that was packed with activity everyday! I thought I would share with you why it was great and some of the things there are to do in DC. We decided to stay at down town DC so we could walk to most of the attractions we wanted to see. Any savings we might find from staying outside the city would be lost by the $50 a day packing costs. Instead we booked a deal at the Loews Madison Hotel that included room, valet parking, and "bonus" 2 cocktails each day for $199 US a night. A gin and tonic goes down nice after walking on average 10 miles a day in 30 degree weather. This was a beautiful hotel in walking distance of most of many of attractions including the White House. The staff was extremely friendly, helpful, and professional. I wouldn't hesitate to recommend this hotel! 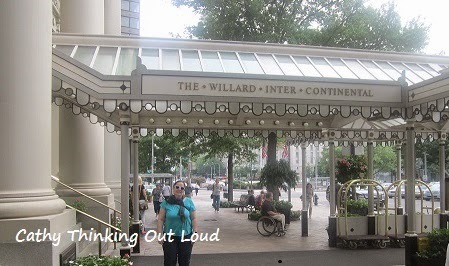 Side Note: I would love to get the chance to stay at The Willard (Inter Continental that is full of history, and a beautiful hotel in the heart of the city. It is definitely on my bucket list. The Cafe du Parc is perfect for people watching and a delish lunch! Start to get in shape now! We walked about 10 miles a day (16 km). That is the point at which the kids and I quit, not because we had seen all there was to see, because it was hot and our feet hurt. My Husband the trooper of the bunch often continued on his own. Parking: $50 or more per day is standard. We had valet parking at the hotel, and it was very convenient for the few times we needed the van to go to an attraction outside the down town core. Subway: We took the Metro that was a few blocks from the hotel to Union Station where the Trolley night time tour of the monuments began and finished. I highly recommend this. The Metro was convenient and definitely cheaper than driving and parking. 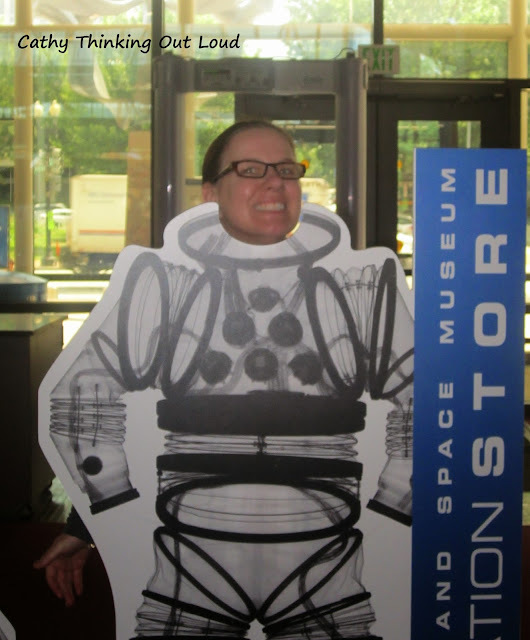 Smithsonian Museums, Galleries: (19 in total in DC area) and the Zoo: ALL FREE ADMISSION! That equals BIG savings for a family of four, since it is not unusual for museums to cost $60-$100 for a family. Plus with so many museums, galleries and the zoo there was something for everyone! For us (aka my Husband) seeing the 2 Smithsonian Air and Space Museums was at the top of the list, and they did not disappoint. International Spy Museum: This is another fun museum that is worth the price of admission at least once. You can find discount coupons in many of the free tourist magazines and flyers available all over DC. Crime & Punishment Museum: This is totally fun and I think worth the price to go. You can find discount coupons in many of the free tourist magazines and flyers available all over DC. National Geographic Museum: I believe if you subscribe to National Geographic there is a discount on admission. I enjoyed this museum, and the memories National Geographic brings back to most of us. It is not a big museum so this will take a half day at most. Memorials and Monuments: There are 18+ monuments that are FREE ADMISSION. I highly recommend that you visit the monuments at night on one of the Trolley Tours. They take care of the traffic, parking issues near the monuments, and trying to follow GPS directions in a busy city. The driver is full of information and trivia about DC and the monuments. There are some discounts for ordering your tickets on-line or check out the free tourist magazines and flyers for discount coupons. Breakfast: For us was juice, cereal, coffee from the Keurig in the hotel, and pastries from a bakery down the street. This helped to save on time and money. There was a CVS with groceries across the street, and we rented a fridge ($25 for length of stay) for our room. Lunches: Were at the museums which can be expensive, if not planned a bit. Take a minute to look at the menu, combos and what can be shared. I always brought our own water (not paying $3 a bottle for water ever!) If you need a bit of flavour added to your water bring along a single serve drink crystal pack. Many of the museums allow you to bring your own snacks or packed lunch you can eat in the cafeteria) In general the food at the cafeterias was fair to good. Dinners: We opted for some healthy fast food options close to the hotel for dinner such as Subway, SweetGreen, and Chop't. Shopping ... duh, there has to be shopping involved! 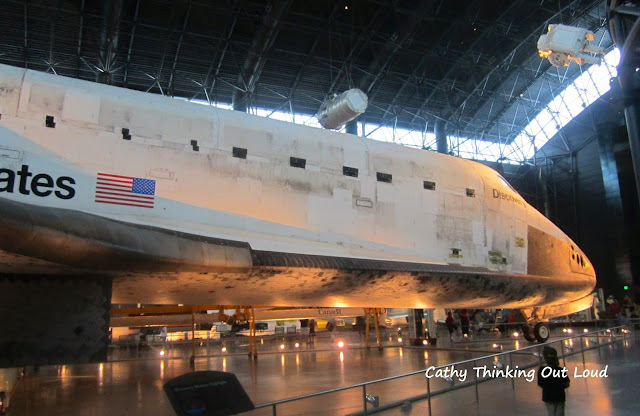 The Smithsonian Air and Space Udvar-Hazy Centre is located in Chantilly Virginia (about a 1/2 hour drive from DC National Mall) is well worth the drive! Since you are already there why not check out the Leesburg Corners Premium Outlet Mall - looking at planes makes me hungry for shopping! (Note: many of the Premium Outlet Malls give out free discount books to AAA and CAA members at the customer service desk/office). There is also a Costco in Leesburgs Corners which is always fun since the US Costco stores carry different merchandise than the Canadian stores. Yes your Canadian Costco card works in the States! That you visit the websites for the various attractions to see what events, discounts, and deals are available. Discounts on admission tickets can add up to big savings for a family of four. Also check the Outlet Mall sites for their discount booklets. If your have museum or gallery memberships check to see if there are any reciprocal agreements (aka free admission). Lastly be sure to check and ask if your CAA/AAA membership entitles you to any savings at all hotels, attractions, or restaurants. Yep, just me Cathy thinking out loud about Washington DC. Note: I have not been compensated in any way for this post. All opinions are my own, and the purpose of this post is merely to share my experiences with my readers. I WAS PICKED AS NEARLY TWINS' FRIDAY FEATURE! I am so honoured to have been chosen for Nearly Twins' Friday Feature. Please go see all the oh so nice things they said about me! Blushing on the outside, all happy and flattered in the inside! I know this is going to sounds silly, even before the words are typed, but I think about it so what better place to talk about it than here. The truth is we have insight into people through their actions, or lack of actions, including social media following, and interaction. I know it is not about the numbers, and who follows you or not. I know it should not matter if someone or a brand follows back, or interacts. I know that expecting a hello that is no way related to a promo, contest, or twitter party is probably unreasonable. Clearly brands have an agenda, as do the bloggers that generate income from blogging, and those tweeting hoping to win a prize. Common sense says when following so many people it is hard to connect with everyone regularly. I know I know I know.....but you know what? It does matter to me. I had a conversation with my husband a while back about interviewing potential employees. He had been told more than once he was excellent at interviewing. So I asked why do you think that is. His response was; when you genuinely take an interest in the person you are interviewing and you listen, you'll know the questions to ask, and they will share with you all you need to know. My response was "so you pretend to care", and he said "no, I actually care what they have to say". It seemed a bit forced to me, but after thinking about I realize it really is as simple as choosing to care. It is through taking a genuine interest that you listen and can then ask the questions that matter, then determining if this person will be a good fit. Clever man, I knew I married him for some reason. The point I am trying to make is by genuinely taking an interest in someone as a person not just as a means to an end, you get all the information you need, and generally a happy ending. I make it a point to try to share information, and to promote brands and bloggers I like. I really make an effort to read posts, and interact just to say hello, or "loved your post", not just enter the contests. I follow many not because I want to read tons of pitches and marketing blurbs all day long, I follow them despite that. I am sure that many follow me despite the volume of tweets (I tweet a lot, no question) and the multitude of subjects I tweet about. I appreciate when people, bloggers, and brands follow and interact with me on a personal level even if much of what I tweet does not fit their niche. It matters to me, and in turn I am very loyal to those who take the time. They are proof that it is possible for even very big and popular people, bloggers, and brands to follow and interact in a meaningful way. To those who do Thanks, and to those who don't you should. I think we all want to be more than a number or sale or stat. 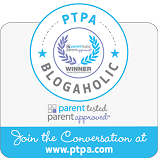 I'm not a contester (but I do enter lots of contests) and participate and in twitter parties. I am not a brand ambassador but I do share and support brands. What I am is in a position to interact and promote the brands and bloggers that are genuine and I feel good about. If I reach out to someone to say hi, or answer a question asked I am in a position to maybe add value in some way. I am most definitely am in a position to make purchasing decisions about the majority of items bought for my family. OK so what? What does that mean and who cares? Well the thing is social media is a way to have two way interactions with brands, bloggers, and people in general. It is from these interactions that I form an impression. I make decisions about what I purchase based on these experiences and interactions. I decide who will get my valuable time from these impressions. Further more in my life outside of social media, I share the good and bad experiences and impressions with friends and family, and listen to the experiences they share. They too make decisions on the information shared. Then like Faberge Shampoo commercial from the 80's (dating myself here) "I told two friends ... and they told two friends, so on". So even just from a pure marketing and sales point it pays to take the time to say hello, and maybe get to know that person who tweets a lot about all sorts of things. Yep, just Cathy thinking out loud again. I have been struggling with writing a post about my experience at Blissdom. As I reflect on what I took away from this experience I have mixed feelings. Did I find “my Bliss”? I found bits and pieces of it. I also learned how I might find other pieces of “my Bliss”. Blissdom was my first conference, and if nothing else I have learned to better manage my expectations. The journey is often more important than the destination, and this journey was definitely worthwhile. The organisers of Blissdom clearly worked tirelessly to make it the very best it could be, not just before but throughout the conference. The speakers, workshops and micro-sessions were great, creating an environment that allowed one to think and question. I tend to be a cynic but also a thinker, maybe an over thinker. I love to "people watch" and see how they act, react and interact. I'm not really the gushing with inspiration type, although many of the speakers and attendees were very inspiring. I am the type that goes through a slow burn thought process, thinking about what this experience has taught me about myself and human nature. I'm always interested to see if what I suspect turns out to be true, and what and who surprises me, either in a positive or negative way. So after some reflection I learned that what we can see of a person though social media is seldom the whole picture, so not surprisingly many people turned out to being different than I thought they would be. Most were some version of what I anticipated, and it was nice to think I still have some ability to read a person and their intentions. A few completely blow me away totally exceeding my expectations, while a few others did not live up to my expectations. I found this to be true for the brands attending this conference as well, but of course the brands are only as good as the people that represent them, and how genuine those people are. Don’t give up. The best might be right around the corner. Tomorrow really is a new day. Treat it as such, and approach each day, workshop, and encounter with a positive attitude and in a mind frame that will let you have the best experience possible. Set specific limits on your pity-fest, and there will be some of this for most, especially the first time attendees. You are not powerless but you can be your own worst enemy. Know your limits and when to take a step back and recharge. Do your homework: Find out as much about attending a conference as you can and what other first timer’s experiences were like, so you can manage your expectations. I highly recommend going with a friend(s). After doing your homework take the time to think about what your expectations are, and how you can manage and change them throughout a conference to ensure you get the most from your conference experience. Tweeps and acquaintances are not friends (or the vast majority of them anyways). They are potential friends waiting to happen, and there is a difference. Stepping out of your comfort zone over and over again is emotionally exhausting, be prepared for that, especially if you are an introvert. This is where having a friend that understands your stressors and limits can help to link or buffer for you and vice versa. Apparently people cannot read your mind, or your telepathic pleas to be invited into one of the groups of happy people who know each other, so you can be part of the awesomeness too. Good news they can’t see your mind’s image of yourself with the giant L on your forehead either. Everyone (including you) has an agenda and has paid for this experience. They are all trying to connect and get value from the experience. Don’t take it personally. It is what a conference like this is all about. There are some amazing strong women (and men) out there that are impressive to watch in action. That is always cool! Don’t let one conference experience stop you from attending another. Learn from the first and take those lessons into the next. If nothing else you always grow in some way from putting yourself out there and stepping out of your comfort zone. Next time I feel alone in a crowd, I will find a way to not allow it to escalate to me feeling lonely in a crowd. Remember what doesn't kill you makes you stronger! I hope this doesn't sound negative because I honestly do not view my experience as such. I think some parts were great and others not so much. I think for some parts of the conference "I" was great and others not so much. Finding my personal bliss is not about everything being perfect, it is about the journey to find the best that I can be. I am not and will never be perfect, so the journey continues. To paraphrase from a film 'Change Your Lens' by Dewitt Jones shown at the What Do You Stand For Workshop: It is not about proving yourself; it is about improving yourself every day. I wish I had been the type to keep a journal, and had written down through the years what I thought I would be when I grew up, or as I entered university, and then the work place. I think looking at what I thought I would be, and what I thought would be important to me compared to what I actually become and what is actually is important to me would be quite comical. I have no memory as a child of wanting to get married and have kids, or of EVER considering being a stay at home Mom might be a choice I would make. Even after having kids, I never really grasped that the babies would grew up and I would be middle aged. SHOCKER! The idea that my parents and in-laws would age was very vague, until one day I looked and realise they are seniors and they have slowed down. They are not invincible and will not live forever. I have no idea how I ended up in retail banking, it was never on my list of career choices. I never considered that hard work couldn't always fix everything. I do have memories of always fighting for the underdog, and a clear sense of right and wrong. I remember loving my English, History, and Politics classes in High School, and not surprisingly I have a Political Science Degree with a minor in Women's Studies. I have always loved animals and remember always wanting a horse. I thought I would work in policy dealing with women's issues, and considered law school to use that degree to support women. I thought climbing the corporate ladder was the goal. I always felt although a relationship is great, I did not need a man. I remember definitely NOT wanting to live in the suburbs. I wanted to live in the heart of a city or in the country and finally get that horse. In University I met a guy. We did not start dating for several years after we met. For many reasons we are a good fit. To the outside world we may seem like an unlikely pair, and complete opposites. If you look closer we are similar in the core values, but our way of expressing them differs. Our parenting style is very different but the goal is the same. The way in which we work is very different but we both have a very good work ethic. He is a Math and Science guy; my strengths are in the softer skills, and creative process. As it turns out I do need a man. I need this man, my partner. We are a team. So we got married. Then we buy a house in the suburbs. (In fairness we looked at least 20 houses in the country) so I would have a yard for the dog I wanted. Hubby is not a dog person; he had not grown up with dogs. On the first visit to the breeder a huge Golden Retriever jumps up into his lap like one of those toy sized dogs, tucks Hubby's arm into his mouth like a soother, and stays that way for the next 20 minutes. Hubby's facial expression was priceless. Six months later we brought our new puppy home (We used a very scientific method to choosing our pup; we picked the one that just kept coming back to us). Next we have a child. WHAT! Can't believe I’m a mother! We arrange daycare as I prepare to go back to work, when Hubby quietly suggests I stay home. He is wondering who our child will tell about the frog he saw if I am not there to listen. I say yes since I am pregnant with our second WHAT! AGAIN! Clearly lost my mind! The feminist in me realises this is an opportunity to teach my sons to be kind and decent, and to respect women. I volunteer at the playgroup, was the registrar at the Nursery School, volunteer 25+ hours a week at my kids' school(s), was a Beaver Leader, and the list goes on. Each of these roles allowed me to impact kids in a positive way, and more often than not support other women. It was at playgroup a group of us started a campaign to the ban cosmetic use of pesticides. It dawns on me that maybe I did exactly what I thought I would do just in a different way. I tried to teach future generations to be tolerant, and girls to feel empowered. I supported women, and was active in my community. I sat on committees that changed policy and law. I stayed a strong independent woman in my role as partner and stay at home Mom in a house of males. I have teens now. I am middle aged. My parents are slowing down and getting older, I can see it clearly now. Corporate life isn't going to happen, at least not in the way I envisioned. Planning for retirement is the goal. That's okay; I have no regrets, or feelings that I missed something by taking a route that was different than what I planned. I am happy that we were open to alternative options and paths in our lives. We have been married 21 years; our kids will finish high school soon and go off with their own ideas of what and who they will be. Lately I have been focusing on those things I can do or change in my life to make it the best it can be. I look forward to the next phases of our lives, understanding that it may not be exactly what we planned or expected. Hugs from Lisa at registration make all things better. Hugs and swag makes all things great! I want to have a convertible Camaro and I will not be sharing with the kids! It is hard to resist the urge to take a nap on the Sleep Country TempurPedic bed in the lobby! The staff at the Delta Meadowvale are the BEST! I am not very photogenic. The really good and the really bad tends to stick around in your digital legacy. Facial recognition software is scary. Never reply to anything negative. Use that energy for good instead. I stand for "Inform, Share, and Link". Look for a good blend rather than balance. Genutax is free and good! Brands have many resources to help you achieve your social good goals. I need some cool pyjamas. I want a Microsoft Surface. Yep, just my Cathy thinking (and reflecting) out loud about BlissdomCA 2013.